"Q&A is excellent. It is so easy to use and because it's Excel based, it is very easy to build financial reports tailored to the respective audience." "If you are using SunSystems, you should be using Q&A". Infor Query & Analysis (SunSystems Vision) is a dynamic, multi-language, multi-currency set of business intelligence tools that is powerful, flexible, secure, and easy to use. Query & Analysis is integrated with Microsoft Office enabling quick user adoption with minimal training and technical skills. Using familiar desktop applications, users can quickly and efficiently create reports that highlight trends, patterns, and exceptions. And since minimal IT support and involvement are required, maintenance is easy, too. A Q&A Datalink is a dynamic, intelligent layer of logic that links the power and flexibility of Query & Analysis with other packages, modules, or databases anywhere in your organisation. LAKE has ready-made solutions with Q&A for Proactis, SAP Business One and Earnie IQ Payroll. Further solutions can be established for any application, database, or table within your organisation. Infor BI Q&A 11 is the next generation of reporting tools from Infor. It combines all components of Q&A - XL, Executive and Alert - in a single incredibly powerful ad-hoc query and analysis tool. 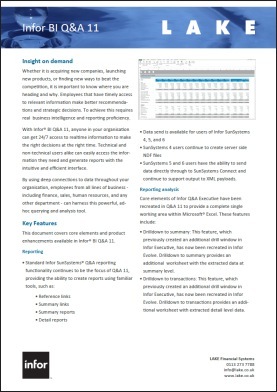 Download a description of key features in Q&A 11. 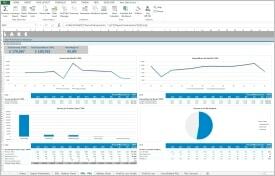 XL is an add-in for Microsoft Excel that provides a faster, easier, and more adaptable way to analyse business data. There is no need to understand sophisticated database to create reports, since the information is provided in an intuitive user interface with common names for database structures. Features include the ability to publish reports to the web, report and query wizards, cube analysis, report designer, extract modes for statistical reporting, macro builder for automating XL functions, and security. Executive is a dynamic analysis and reporting application that includes powerful analytical capabilities such as drilldown, expand, breakout, and cube analysis. These features make it easier for business users to analyse trends, problems, and opportunities that are often concealed within corporate transactional data. Frequently used analysis procedures can also be saved and replayed in the future. This component includes many other features such as the ability to combine data from multiple applications into a single, concise report and the ability to publish reports to the web. Alert automatically manages, runs, and distributes reports based on scheduled events. This component enhances the ability to identify, analyse, and report on performance and trends concealed within the database and facilitates information delivery by automating aspects of the reporting process. Users can create, edit, and schedule tasks that can be processed on a time or event basis. Alert has direct communication with other Query & Analysis components such as XL. Further brochures and white papers are available from the Resource Centre.